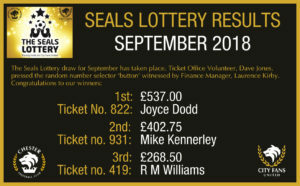 Seals Lottery is open to all and you can have as many numbers / entries as you like! Entry costs just £5 per month. Each month, 50% of the monthly subscriptions are paid out as prize money to three monthly winners. The first prize wins 40% of the prize fund,with second prize winning 30% and third prize taking 20% of the prize fund. The remaining 10% is rolled over into a special Blues Bonus Draw, held every six months, for members who have participated in the previous six months draws. 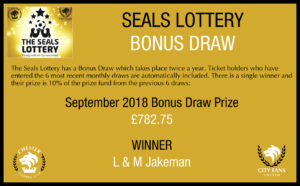 To get involved, simply download the Seals Lottery Application Form today.